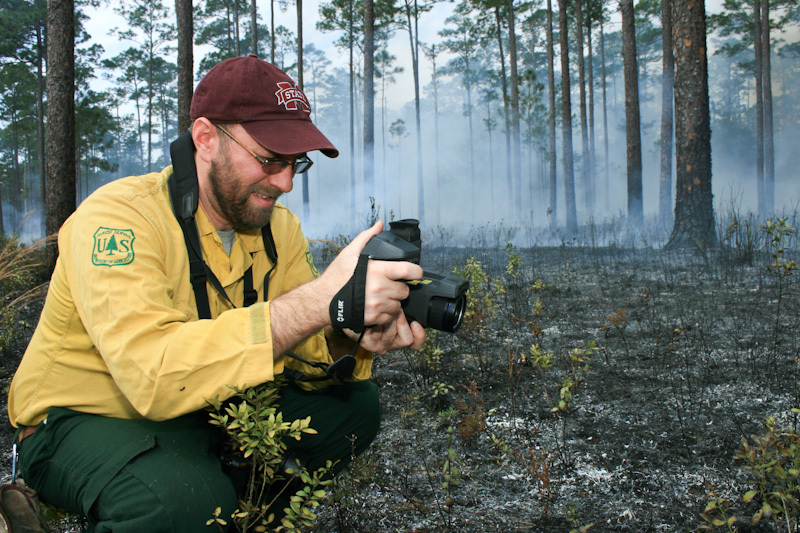 A fire scientist records thermal imagery during a Florida prescribed fire. By David Godwin. Last week at the International Association for Wildland Fire 4th Fire Behavior and Fuels Conference in Raleigh, North Carolina I presented a poster sharing some of the lessons learned over the past two years while developing the Twitter social media program (@SEFireScience) for the Southern Fire Exchange (SFE). This was a program that I started while working part-time for the SFE (and full-time on my dissertation) to help bring the SFE fire science delivery program into the social media world. @SEFireScience has been a great success and has even been lauded by the Joint Fire Science Program as a model of social media development in the fire science consortium network. Check out the poster (.pdf) below to download a copy or to learn about some of the metrics, tools, and apps that I’ve used in developing the program.